Our collection of Hydrangeas now covers almost than 250 varieties. For the summer of 2019 we will be introducing to our collection some brand new varieties together with some more established unusual varieties of hydrangeas. These include some notable varieties of quercifolia hydrangeas, Amethyst, Harmony & Little Honey plus more. The brand new varieties of interest are Golden Annabelle a variegated leaved arborescens and beautiful paniculata varieties of Little Spooky, Little Fraise and Skyfall as pictured. We are pleased to announce we will also be one of the suppliers of the award winning RHS Chelsea Plant of the year 2018 Hydrangea Runaway Bride Snow White. A new hybrid hydrangea with a profusion of gently trailing beautiful white flushed pink lace cap flowers as pictured. 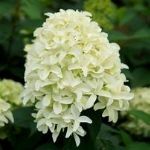 The new introduction of Hydrangeas are listed below to browse through and will be available for advanced purchase in early 2019. RHS Chelsea Plant of the year 2018. Showy profusion of white lace cap flowers flushed with pale pink as the season continues. Available to pre order now for delivery May June 2019. Deciduous climbing hydrangea with pink flowers in summer flushed cream with age. Available May June 2019. New climbing hydrangea variety with variegated silver green leaves. Available May June 2019. Large striking pink colour flowers in summer. Available to pre order now for delivery May June 2019. Large rounded light salmon pink colour flowers in summer. Available to pre order now for delivery May June 2019. Striking variegated leaves with lime green creamy white flowers. Available May June 2019. Large balls of pink flowers supported by strong stems in summer. Available May June 2019. Large white then pale pink turning to deep pink lace cap flowers in summer. Available May June 2019. Double pink lace cap flowers from late spring to early autumn. Available May June 2019. Bi-colour Hydrangea with deep pink red flowers edged white in summer. Available May June 2019. Large flat pinkish white lace cap flowers from July to September. Available May June 2019. Ever changing red purple blue with lime green mophead flowers in summer. Available May June 2019. Ever changing fuchsia red with lime green mophead flowers in summer. Available May June 2019. Large white mop head flowers edged bright pink fringed in summer. Available May June 2019. Long lasting pink or blue mophead flowers from summer to autumn. Available May June 2019. Large lacy panicles of white green then cream flowers in summer. Available May June 2019. Large panicles of cream white flowers with light green turning pink. Available May June 2019. Dwarf variety with rounded panicles of white flowers in summer. Available to pre order now for delivery May June 2019. Dense cone shaped panicles of snow white flowers with green tops in summer. Available May June 2019. Large cone shaped pastelgreen flowers turning white, cream, green, then pink from early summer into autumn . Available May June 2019. Beautiful large hyacinth like clusters of white flowers in summer turning pale pink. Available to pre order now for delivery May June 2019.